Tri-Mer specializes in the design, manufacture and installation of polypropylene process tanks for heavy-service use. For more than 40 years, we have engineered and fabricated 1" process tanks for the broadest range of industrial applications. Polypropylene: the best material for process tanks. 100% polypropylene is a high-strength, monolithic material that will not corrode, become brittle, or de-laminate, even when exposed to aggressive chemicals, over very long periods of time. It has very low moisture absorption, is compatible with both high and low temperatures, and has excellent thermal insulating properties. 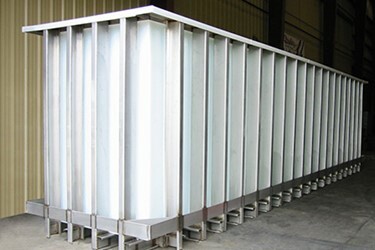 It is exceptionally stress and crack-resistant, and has excellent dielectric properties. Polypropylene is resilient, and well-suited to manufacturing and process environments where impact can occur from parts handling devices, fork trucks and hoists and other material handling. If damage occurs, it is easily repaired, without interrupting service. Polypro is the lightest in weight of any thermoplastic. It is exceptionally resistant to strong acids – even at high temperatures – and also resists alkalis and oxidizers. It can be welded and thermoformed, and has a high strength-to-weight ratio. Polypropylene is easy to fabricate, economical, and is ideal for the manufacture of tanks, tank hoods, ducting and workstations, for industrial and laboratory environments. Tri-Mer fabricates process tanks from polyethylene, PVDF, PVC, PE, CPVC and stainless steel, in addition to polypropylene. Tri-Mer process tanks have the advantage of double weld-strength, inside and out. Tanks can be designed with or without external supports. In addition to our standard tank series, Tri-Mer engineers custom tanks to meet customer needs and space limitations, in rectangular, circular and custom shapes. Lengths are up to 110', depths up to 15'. We understand the importance of quick, easy access, and the need for tanks to integrate with existing plant equipment and work flow. Tri-Mer works with your production, product management and maintenance staffs in the design of a tank, or tank farm, to meet your specific needs. Tanks can be supplied alone, or as a package, with complete material handling, ducting, piping, pumps and agitation, and/or instrumentation as required. Tri-Mer offers a broad range of tank covers for complete, one-source responsibility and maximum cost-efficiency.